Viewing 11 of 11 items. The smoothly tapered contours and wide mouth of the Classic Pub glass promote the desired frothy heads of classic ales and stouts, creating an authentic beer presentation. Each glass in this set of.. The elegant Munique Chalice, featuring a tulip shape and stemmed base, boldly displays the vivid colors of aromatic fruit beers, elevating the overall tasting experience. Each glass in this set of.. Perfect for pilsners, bocks and lagers, the Tall Pilsner showcases color, preserves carbonation, and helps maintain a perfect head. 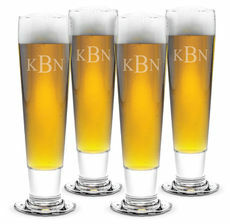 The classic silhouette, featuring a thick base, and slender, tapered..
Accommodating mounds of foam, maintaining effervescence and capturing the signature aromas of wheat beers, the statuesque Weizenbier creates an experience certain to please both the eyes and the..
Showcase your favorite brews with this classic set of Monogrammed Beer Mugs. Each sturdy, 15-ounce mug in this set of four features a starbust design in the base and is individually hand-decorated.. 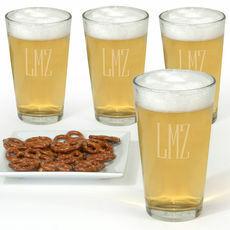 Ensure the perfect pour of your next lager with this stately set of four Monogrammed Pilsner Glasses. 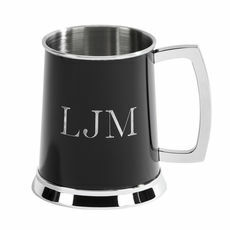 Each glass holds 20-ounces and features a slender, tapered design, which serves to maintain both..
A sleek and updated classic tankard with a polished black finish. 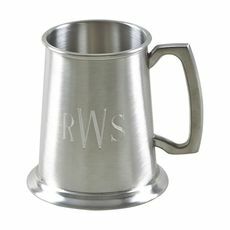 Our 20 oz stainless steel tankard is 4.5" tall and features a brushed steel interior with highly polished accents on the handle..
You don't have to be a pirate to enjoy your favorite ale or beverage in our 16 oz pewter tankard with a brushed satin finish and a glass bottom. This item has a non-tarnish finish and is 4.5".. If you are a beer drinker, you are likely serious about your drinks. So, it's only fitting that you have proper personalized glassware for the perfect pour. 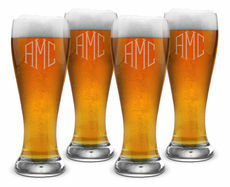 Celebrate your love of beer with a pilsner or microbrew glass to create a personalized beverage. We offer a deep etch sand carving process and we are confident that you will see and feel the quality which adds to the enjoyment of the products. The sand carved barware is done by skilled artisans. You will enjoy the upscale quality and will be very proud to provide these as gift items as well. These make a fantastic Father's Day or Mother's Day present, birthday gift or holiday gift. When you are pouring your favorites for your friends and family they will be very impressed with your specialty glassware. 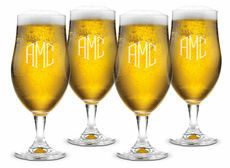 Whether you prefer a monogram, three initials or text on the glasses, these are the type of items that will be a great addition to a bar and enjoyed for years. We carefully deep etched into the glass to create a perfect imprint and we offer many styles from pub glasses to Belgium beer glasses and more. 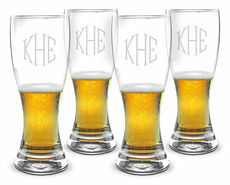 If you are looking for groomsmen gift, there is nothing that can beat a great set of personalized beer glasses. Make every celebration special and upgrade your bar today with glasses that will be uniquely yours.